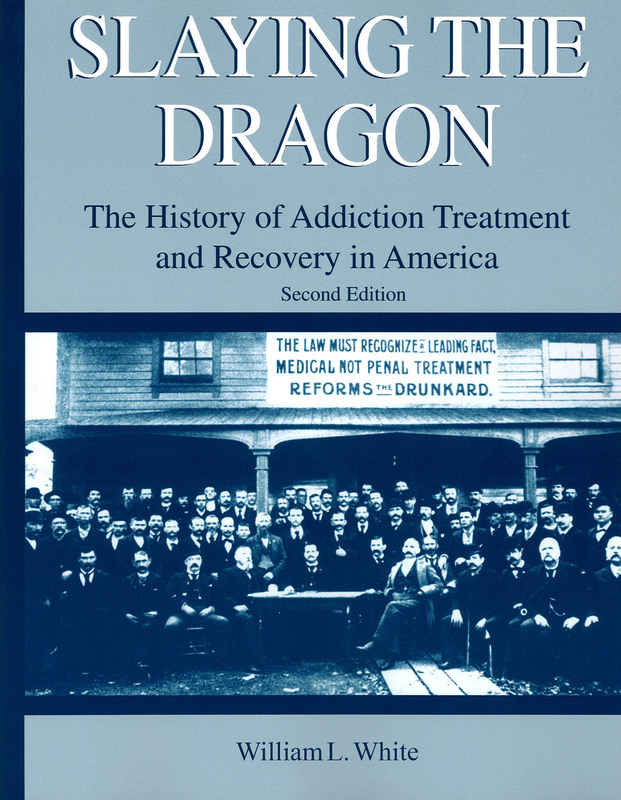 Foreword from the Editor: William L. White’s Slaying the Dragon: A History of Addiction Treatment and Recovery in America, 2nd edition (Chestnut Health Systems, 2014) chronicles the history of treatment institutions and mutual aid movements in the U.S. from the eighteenth century to the present. White’s sweeping history is both institutional (he explores a variety of treatment providers and approaches) and social (he excavates the stories of silenced and stigmatized recovery groups). The book deserves a place beside David Musto’s The American Disease on the bookshelves and comp lists of every alcohol and drug historian-in-training. Beyond academe, Slaying the Dragon has had a tremendous impact on the recovery movement since the first edition was published in 1998. Treatment institution records are fragmented and difficult to come by. Mutual aid societies have an elusive oral tradition. To date, most historical work on addiction treatment and recovery in the U.S. has been relatively narrow in scope. Finding diverse material synthesized in a single reference text, White reflects, “helped many people in recovery see themselves as ‘a people’ and contributed to the rise of a new recovery advocacy movement in the U.S.”– a movement evidenced by organizations like Faces and Voices of Recovery, the rise of recovery-oriented systems of care, and the promotion of the U.S.’s first recovering ‘Drug Czar,’ Michael Botticelli. Bill White, who has been working in the field of alcohol and drug treatment since the 1960s, joined Points for an interview about the history and future of addiction treatment. Slaying the Dragon is a master narrative of the history of addiction treatment and recovery in the US. Can you briefly recap the story it tells for us? The opening sections of Slaying the Dragon describe Native American and colonial responses to alcohol and other drug problems, review the rise of 19th century recovery mutual aid societies (including the Washingtonians, the Fraternal Temperance Societies, the Ribbon Reform Clubs, the Ollapod Club, the Godwin Association, and various moderation societies), and then recount the rise and fall of 19th century addiction treatment institutions—inebriate homes, inebriate asylums, private addiction cure institutes, and bottled and boxed home cures for the alcohol, tobacco, and drug habits. The middle sections explore the early history of treatment for addiction to drugs other than alcohol, describe the history and program of Alcoholics Anonymous, and recount the rise of the modern alcoholism movement. The final sections detail the birth and evolution of modern addiction treatment, outline historically unprecedented changes within the culture of recovery in the U.S., and attempt to extract lessons from this history that can influence professional and institutional decision-making. Slaying the Dragon is a big (557 pages), sweeping story presented in bite-size, self-contained stories of key ideas, people, and institutions. It is written in a language and style that is accessible to people in recovery, addiction professionals, and policymakers, but it also provides a link to more than 100 pages of posted research citations for contemporary and future historians. The table of contents and a sample chapter are posted online at www.williamwhitepapers.com. How has the history of treatment and recovery changed since the first edition was published in 1998? What are the most significant recent developments? The additions to the second edition reflect dramatic changes that have unfolded in addiction treatment as an industry (e.g., organization, funding, cultural status) and as a clinical enterprise (evolving treatment methods). The addiction treatment industry continues to grow in spite of episodic challenges to its legitimacy, but it remains on probationary status as a cultural institution and will face significant threats to its character and existence in the coming decades. Such challenges include a cultural backlash emanating from fundamental flaws in the design of addiction treatment, sweeping service integration initiatives, and threats posed by state and local fiscal austerity. Recent developments within the larger history of recovery include the continued growth and philosophical diversification of recovery mutual aid societies, the growth of internet-based recovery support media, the emergence of new recovery support institutions (recovery community centers, residences, schools, industries, ministries, cafes, etc. ), and the birth and maturation of a new recovery advocacy movement. And of course, we have had the rapid acceleration of addiction research that has heightened tensions between what we know about the nature and resolution of alcohol and other drug problems and the frontline clinical practices found in most addiction treatment programs. The new edition includes 150 photographs. Which is your favorite, and why? I have two favorites. 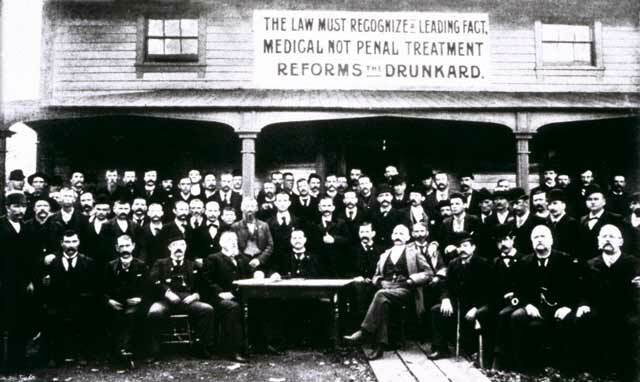 The first is the 1891 cover photo of the founding members of the Keeley League (a patient mutual aid society established within the Keeley Institutes) standing under a sign that reads, “The law must recognize a leading fact, medical not penal treatment reforms the drunkard.” After nearly three decades of trying as a society to once again incarcerate our way out of addiction problems, I find that photo a visual commentary on our failure to listen to history and a testament to the primitive forces that drive addiction-related social policy. 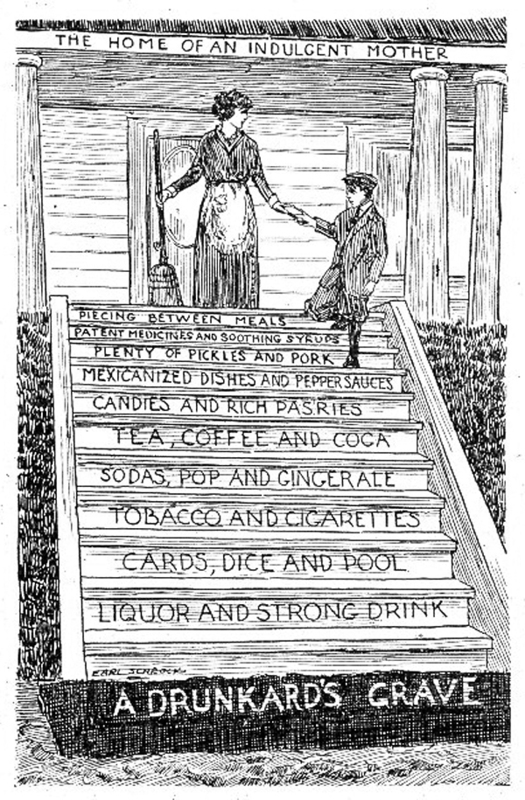 My second favorite is a 1915 temperance poster entitled “The Home of an Indulgent Mother” showing a mother and her son at the top of a set of stairs with each step noting a step toward the slippery slope to “A Drunkard’s Grave.” The downward steps—one of many American alcoholism progression charts—include piecing between meals; plenty of pickles and pork; candies and rich pastries; tea, coffee and coca, sodas and ginger ale, tobacco and cigarettes; cards, dice, and pool; and liquor and strong drink.” That photo reflects my fascination with the history of factors thought to cause addiction over the past three centuries as well as the many bizarre and potentially lethal methods claimed as addiction cures. The press release for Slaying the Dragon hints that the new edition offers a “critique of current approaches to treatment.” What is your assessment of the present-day treatment infrastructure? The institutional infrastructure of addiction treatment is quite vulnerable, as indicated by limited funding diversification, aging leadership, workforce development challenges (including high clinician turnover), weak capacity for implementation of evidence-based innovations in treatment, and weak technological capabilities to face the growing integration of addiction treatment, mental health and primary healthcare. But the cultural fate of addiction treatment may well be dictated by a more fundamental flaw in the very design of addiction treatment and the field’s capacity or incapacity to respond to that design flaw. Modern addiction treatment emerged as an acute care model of intervention focused on biopsychosocial stabilization. This model can work quite well for people with low to moderate addiction severity and substantial recovery capital, but it is horribly ill-suited for those entering treatment with high problem severity, chronicity, and complexity and low recovery capital. With the majority of people currently entering specialized addiction treatment with the latter profile, the acute care model’s weaknesses are revealed through data reporting limited treatment attraction and access, weak engagement, narrow service menus, ever-briefer service durations, weak linkages to indigenous recovery support services, the marked absence of sustained post-treatment recovery checkups, and the resulting high rates of post-treatment addiction recurrence and treatment readmission. Addiction treatment was developed in part to stop the revolving doors of hospital emergency rooms, jails and prisons. For far too many, it has become its own revolving door. Slaying the Dragon documents these weaknesses and current efforts to extend the design of addiction treatment toward models of sustained recovery management nested within larger recovery-oriented systems of care—with the “system” being the mobilization of recovery supports within the larger community. Let’s get speculative. If you had to choose an addiction treatment provider for yourself or a loved one–and you could choose from any organization, at any time in history– which organization would you select? Which one would you avoid at all costs? I receive calls every day from people asking variations of these questions. There isn’t a universally “best program.” What we are looking for is the best match between the characteristics of a particular person at a particular point in time and the characteristics of a treatment setting at that same point in time. What could be the best choice for one person would not necessarily be a good choice for another, and a good match today might not be so a year from now—because both individual/family needs and organizational capabilities evolve dynamically. But those best matches do seem to share some common characteristics: accessibility; affordability; organizational and workforce stability; individualized, evidence-based, and family-focused care; a recovery-infused service milieu; effective linkage to recovery community resources; and sustained support for both the individual and the family. What also matters as much as the treatment approach and the treatment institution is the primarily clinician who will be providing that treatment. Recovery outcomes vary widely from counselor to counselor. I avoid recommending any treatment program that claims to have THE solution to addiction. That type of institutional and clinical arrogance is more associated with fraudulent exploitation and harm in the name of help than stable long-term recovery. Also not recommended are programs that continue to use confrontation and humiliation as therapeutic devices, in spite of decades of research on their ineffectiveness and potential harm. The programs with the best long-term recovery rates offer a wide menu of “active ingredients” that can be combined, sequenced, and supplemented to address the needs of individually and culturally diverse patterns of alcohol and other drug problems. And they provide clinicians with track records of achieving such nuanced treatment. Bonus Question: For the audio book, who should provide the narration? I would probably choose an actor in long-term recovery who can bring some authority and authenticity to this subject and whose voice could carry all of the emotional nuances that pervade the stories in Slaying the Dragon—perhaps Anthony Hopkins or Samuel Jackson. Mr. White’s book is an extraordinary work of scholarship. For me, the historical elements, the Washingtonians, Keeley Institutes, the lay therapy movement, etc. are particularly fascinating. This book is not JUST for treatment professionals. Thanks to my friend Mr. Fadi who introduced me to this valuable n wonderful literature about addiction field where I have spent my life. A wonderful literature of Drug addiction field.This will enhance knowledge n informations of readers about thus challengeful subject.